Ingredients: Micellar Whey, Maltodextrin, Natural Flavors, Salt, Soy Lecithin, Gum Blend (Cellulose Gum, Xanthan Gum, Carrageenan), Acesulfame-Potassium, Sucralose. Allergen Warning: Contains milk and soy ingredients. Processed in a facility that processes egg, fish, tree nut, and wheat ingredients. Mix 1 serving (1 scoop) with 8 oz. of cold water or skim milk in a glass or shaker cup twice daily. Use between major meals and before and after exercise..
Micellar Whey is the world's first ever sustained release whey protein making it ideal to use at night. Traditionally casein has been the ingredient of choice at night due to its slow release which feeds your muscles while you sleep but with Micellar Whey you get the same slow release while retaining the superior protein quality of whey protein. Exclusive to Muscletech, Micellar Whey means you can now benefit from whey protein around the clock and get a higher level of recovery promoting BCAA's and Glutamine than would be possible from casein as well as benefiting from whey protein's superior taste and mixability. Micellar Whey is designed for use at night. As a protein source which can help prevent your muscles from being broken down for fuel, Micellar Whey should be used throughout the year. Micellar Whey can also be used during the day being especially valuable if you would otherwise struggle to eat a meal regularly as it can then keep your muscles fed for several hours between meals. Micellar Whey is the ideal night time protein for everyone seeking better recovery and especially those who do not like to use casein due to it's more difficult to digest nature. Muscletech's Micellar Whey brings something revolutionary to the protein powder market by being the first protein which combines the high protein content and protein quality inherent to whey protein but with the added advantage of having the slow releasing properties of casein protein. With whey protein often pigeonholed as a post-workout recovery supplement, Micellar Whey now means users can benefit from whey protein at all times of the day. Most people tend to use casein proteins at night thanks to its ability to be digested slowly over a long period of time which helps to support your muscle tissue with a steady supply of amino acids which are broken down from the casein to ensure that even in the middle of the night your body's muscles still receive a supply of amino acids to promote cellular recovery and muscle growth. However, in many ways whey protein is considered superior to casein protein as whey is higher in the most important BCAA's that most promote muscle recovery, is lower in fat and easier to digest for most people. Ultimately, whey protein is higher as well in a score of protein quality used to benchmark proteins against each other. With Micellar Whey, users can now benefit from the slow releasing properties of casein protein but crucially, while maintaining whey protein's other qualities. Given that whey protein is naturally higher in the most important amino acids for building muscles, BCAA's, it is no surprise to see that Micellar Whey is significantly better than casein as a source for these key triggers of the muscle building process. Whey protein has a biological value of 104 while casein protein has a BV of 77. This means whey protein is capable of delivering a greater anabolic boost to your muscles than casein and is absorbed more quickly. Muscletech have put Micellar Whey through a specialised process to increase the molecular weight of the whey. By doing this the whey particles in Micellar Whey are absorbed more slowly than regular whey protein particles which are optimised for faster delivery. The new, larger whey particles retain the other benefits of whey but their larger structure is now comparable to that of casein and it results in similarly sustained release of amino acids to the muscles. Muscletech have performed some actual research to determine how fast Micellar Whey is digested by the body compared to Micellar Casein and Whey Protein Concentrate. 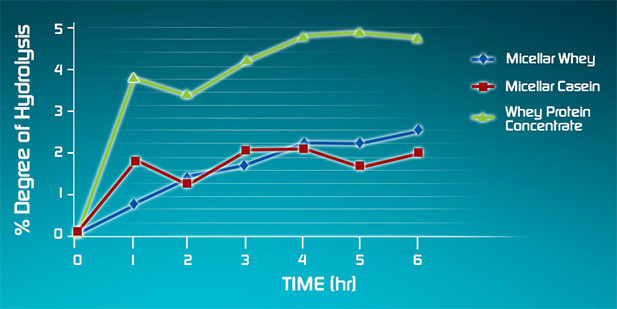 The research was conducted using a method which compared the degree of proteolytic hydrolysis for each protein over a period of hours. This acts as a marker to compare how the proteins would break down when consumed. The study showed that while Whey Protein Concentrate showed a high degree of hydrolysis which indicates fast absorption, both Micellar proteins had a similar rate which translates into both being slow release protein. Had both the chocolate and vanilla - preferred the chocolate. Expect it to mix differently to standard whey and be of a thicker consistency when mixed and not be quite as nice to drink (IMO) and you'll know what to expect. Ideal to drink before bed or at times when you're not going to have a chance to top up with protein regularly. Good product overall.